Anyone used Ipe' for outdoor furniture? I can get a good deal on it: 1 x 6 x 6 dimensioned (no planing necessary) for $13 apiece. Has anyone used it and is there anything I should know about this species before I go for it? Good project to just the domino I just received! Re: Anyone used Ipe' for outdoor furniture? I haven't used it but my hardwood supplier just sent me a flier with some trivia questions. The question was: What wood is naturally fire resistant and shares the same Class A fire rating as concrete and steel? The answer: Ipe Pretty interesting. I am in the same boat as you. In fact I am hoping to justify a Domino purchase based on this. I have seen IPE stuff that looks quite good. have you seen any plans/pictures that are interesting? I am looking for them myself. If you find any others that are interesting please post. I have some experience with Ipe; decks, interior and exterior furniture, and interior T&G flooring. I would stay away from it. Most importantly for myself toxic. I break out in a rash and the airborne dust causes respiratory problems. 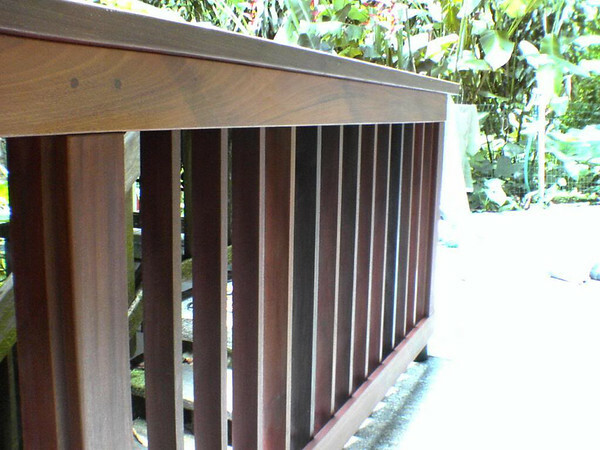 I think Ipe might be similar to Mahogany in that it's term used to describe various species with similar qualities. What you may be buying may be different that what I had. If you have the time I would obtain a sample and experiment paying close attention to the toxicity factor which can be significant. I've had lots of experience with Ipe as we supply lots of hardware and fasteners for decking. Those smaller 6" planks might be perfect for your yard furniture. It is indeed hard and dense but not unworkable. Consider it's heavy weight when designing your furniture. It is stiff...... some folks even use 3/4 thick material on 24" OC for residential use, so take advantage with that in mind when you design. Color varies as Ipe is not generally a species but a family of species. I've seen light brown homogeneous as well as pieces with interesting grain and nice "inking". Stainless fasteners are best because these tropical hardwoods have higher concentrations of tannic acid (thus their resistance to rot, insects and fungi). Because of this, the splinters hurt more too! Most Ipe I've seen is really stable and you'll not notice much tangential movement. It machines well with any carbide tipped tool. If left untreated, it will fade to a homogeneous grey. Penofin is a great (but expensive) treatment that works well to keep that warm brown color. Ipe can be worked fine with any of your Festools. You'll appreciate the dust extraction. The dust is particularly irrigating to the nose and throat. will cutting it with my TS-55 dull the blade? how about the domino cutters? Ipe is three times as hard as oak and about seven times as hard as poplar. If you are familiar with these either of these woods this should give you a scale to compare the amount of machining you can accomplish before edges need to go to the sharp shop. If it we're my project, and say I was building several benches, I would have any blade that had a lot of contact with the wood sharpened. I just wouldn't expect that blade to perform the way I'd want after such an endeavour. Ipe' is cool stuff. Heavy, hard, and durable. How durable? The "dock" in front of Treasure Island (now "TI") in Las Vegas is ipe'. How many tens of millions of people have walked over it? Who knows, but it's still in great shape. Your great-grandchildren will have to decide who inherits that furniture. "Pre-drill your nail holes" is what I was told by a friend who was kind enough to take away the tailings from the construction of the aforementioned decking. He carved a small solid box out of a larger piece. It was beautiful and weighed about twice what you'd think. 100 crosscuts. And dust collection, definitely, as the dust off Ipe is extremely fine. I built an outdoor bench using IPE strips. Definitely makes some fine dust on your saw and router. Be sure to seal the ends if you use it to eliminate checking. A waxy substance works best for sealing. It is a very dense wood. I have used Penefin on it, but it hasn't lasted. Turns to a silver color like teak as it oxidizes. Ipe is what they use to make "skids" to hold clay bricks when they fire them in their high temperature kilns (at least in Canada). My uncle took the used skids to make some flooring - dulled every tool and machine that it came in contact with. He tried nailing every kind of nail you could imagine through it (even a 10" spike), and it bent every darn one. Crazy stuff. I may have to build my "dog house" out of it, to shelter me from my wife's fury if I don't finish our house by August 1st! Hindsight is like foresight, but with no future. I made some adirondack chairs from Ipe'. I showed them on Lumberjocks and included my impressions of working with Ipe'. I have made a handfull of bar dinning tables and stools out of IPE and Mahogany. We have several lined up to start in the next month or two. For the tables I am planning to use the Domino XL. and join the boards after running the through the table or track. That way the joints will tights and clean along with preventing water and dirt to settle in the groove. What do you have to make exactly? Post some picts or sketch? I just installed 1500sf of IPE. We had a change order to lay the boards in 2ft, 5ft , 8ft , and 11ft joint. "Wackie designer". I used the XL with the sips. We made over 2000 holes and the bit it still good. There bits are good for 5000 - 14000cuts. If you break it then you don't know what your doing. If you dull it then your getting your money's worth. Whatever you do with IPE use the dc. The dc sucked up a lil over 28gals of IPE dust in about 3/days from Kapex, Domino and track saw. What was not collected wasn't even worth a conversation. On jobs that I have Festie setup I don't bother to bring a dust pan or broom. Know keep in mind these are outdoor jobs. Inside just lay 4 - 6 mill plastic right under your work station is optional. We are citydecksinc.com and burn miles of IPE Mahogany and Cedar through our Festi systems. We use the Festi's Aluminum cutting blades and 2-3 per job incase the dull we just do a quick swap out. I also have several of older 10" blades fitted for the Kapex. They work perfect and saved a bought load of cash. Good lord. The stuff cuts fine, mills fine and works fine. working with Ipe, just keep them clean. I probably have cut a 1000 mortises with my 6mm domino cutter and it cuts like the day I got it. Wonderful wood, lasts forever, needs no maintenance. Don't hate it because you don't understand it. Yes, I used a boat load of 5 1/2 inch used Ipe decking to make occasional tables for vacation rentals. Glues up ok but I'm not sure how that will last. Used Festool Domino 500, orbital sander and their Kapex mainly as I had them in my shop and they are good tools for dust control. Ipe dust is very fine, gets everywhere and plays heck with your nose and lungs, don't breath the stuff for any reason it's murderous. I can feel it now and wore a mask most of the day. The wood itself is dense as heck and heavy. Splinters easily and the splinters seriously hurt. On the plus then nothing is going to have it for lunch and it won't rot for any reason. I'll let it weather to grey rather than try to treat it. The exception was the prototype my wife snagged and we stained that for use in a screen porch. I'm new to this wood but it seems to act like teak, hard on tools I'm guessing so aim to sharpen at least the Kapex blade. Domino jointer had no toruble and I've used offcuts to make more domino's stock. I'm in the middle of the 3rd Ipe deck on my house, a big 700 square footer, a small 80 square footer and a tiny 42 square footer. Included in these projects were about 45 post wraps. I built them by screwing and gluing using a kit of SS screws, Ipe plugs and drill and counterbore bits from Deckwise. I used Titebond III for the joints and screwed on 10" to 11" centers. The first deck is 4 years old and the post wraps are holding up beatifully. For Ipe you need carbide cutting tools, before I started into this I installed Byrd heads on my jointer and planer. But Ipe does not dull good quality carbide quickly. I figure I have run at least 4,000 lineal feet of Ipe through my planer and the cut quality is still fine, I have not rotated any inserts and the surface finish is excellent. The drill/counterbores that come with the Deckwise kits are HSS and they work just fine. You get a set of 4 bits with the kit that include 350 screws and plugs and I run out of screws and plugs while only using 2 bits. Drilling Ipe is a bit of a pain because the flutes of the drill clog with chips, so the typical routine is to back out the drill 2-3 times on each hole...sometimes the chips fly away and sometimes you have to strip them. You need to use a bigger pilot hole if you are screwing into Ipe than typical woods, for #8 screws I find a 5/32" bit gives good holding without taking undue torque to drive or risking broken screws or stripped recesses. With an annual cleaning and oiling the appearance of Ipe is beautiful and we've been doing that so far. At some point we may let it go grey but it sure looks nice after oiling. Oiled Ipe looks amazing, the amount of maintenance is daunting. I have no doubt you'll let gray at some point. Would you mind sharing some pictures of your decks? Here in Michigan we have just exited a loooong winter and deck cleaning and oiling season is near...expect a few weeks before pix are available. OK so after a few days powerwashing and a few more oiling we're done for this year. Good looking deck...it's beautiful when its oiled. Was that deck just power washed with no sanding? The reason I ask, is I have to do the same thing, sanding & oiling every year to a teak table, 10 teak chairs and a teak chaise lounge. It's a real PITA. If I could just power wash and then oil that'd make a huge difference. The approach I use is to powerwash thoroughly to remove most of the oxidized gray surface, then spray on Messmers Deck Cleaner with a garden type sprayer keeping the surface wet 15-20 miutes then lightly scrubbing with a deck brush and a final powerwashing. I use the widest spray nozzle on my powerwasher and get close enough that the fan is about half the width of a nominal 6" deck board and do 3 passes on each board going down each side then up the middle. 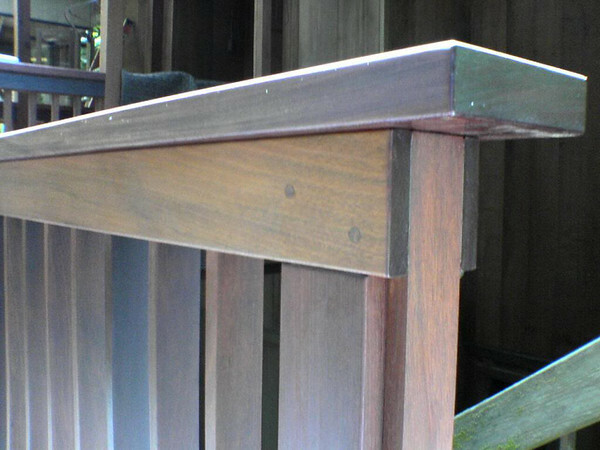 The hardness of Ipe lets you powerwash more aggressively than with cedar or treated SYP. I don't sand except for prominent scratches as the general opinion is that sanding leaves a more closed surface that doesn't allow the Ipe Oil to penetrate as deeply. I was going to ask what finish you use but since you mention Messmers I assume you’re also using their stain also. I use Messmers UV Plus Natural, but I can no longer get it locally and no one will ship it to Hawaii since it’s considered Haz Mat. Really like the look. Not sure what I’m going to use when I run through my last gallon. I need to sand since power washing doesn’t remove all staining plus I get bleach overspray since I need to power wash and bleach concrete several times a year. I’m in a very wet environment. Lots of algae, mildew, etc. I use West Systems Gflex to treat all end grain and any surface underneath where water tends to hang or drip from. Also if joints aren’t glue with epoxy, they are embedded in polyurethane caulk. I've been using Ipe Oil for the finish and I am satisfied with it...I just wish it would last 2 or 3 years! Thanks  for the info...I'm going to try your method with one of the chairs and see what happens.